The quality of this rug is nice, it's a low pile but soft. The colors are vibrant and close to the photo shown. The color is listed as cream and navy but it's more of a teal color with very little navy. The carpet I received has a lot of pink and orange in it. It's a busy rug but nice. 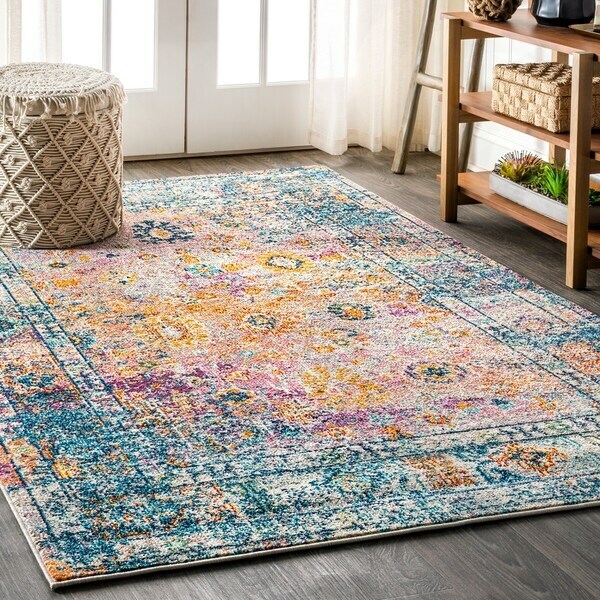 Inspired by a stunning antique rug, with its short pile and worn center, this replica is given new life with a combination of bright colors that give it a new bohemian flair. The classic motifs of flowers, vines, medallions, and ikat shapes stun in shades of aqua, orange, fuchsia, and gold. And while the rug may be a showstopper, you can still feel free to walk all over it -- the power loomed polypropylene is super durable, while feeling great underfoot. JONATHAN Y Bohemian FLAIR Boho Vintage Faded Cream/Navy 5 ft. x 8 ft. Area Rug - 5'3" x 7'7"